"Everybody Has the Right to Be Wrong!" "I'll Only Miss Her When I Think of Her"
"en:(Love Is) The Tender Trap"
"There's Love and There's Love and There's Love"
"Aren't You Glad You're You?" "You May Not Love Me"
^ Palm Springs Cemetery District, "Interments of Interest"
James Kaplan (2010). Frank: The Voice, Pages 49,666-669. Wilfred Sheed (2007). The House That George Built, "Jimmy Van Heusen: On The Radio With Bing and Frank" Pages 225-251. Alec Wilder (1990). 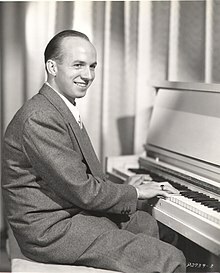 American Popular Song, "The Great Craftsmen: Jimmy Van Heusen" Pages 442-451.